Fiji’s draft media decree continues to be criticised from within and outside the country, but the government is showing no signs of backing down or softening any of its provisions. "I would also attribute some of this hysteria to some local media organisations that are probably whipping up this frenzy and trying to portray an image of Fiji that is far from the truth," he added. Breach of content regulation or disclosure provisions of the proposed law could lead to a maximum fine of $F500,000 (about US$258,000 ) for the media company concerned, and a maximum fine of F$100,000 (about US$52,000) or a maximum jail term of five years, or both, for publishers, editors and reporters. Critics of the government say that it has no one to blame but itself for any negative perceptions about Fiji or the draft decree. After all, it was only last year that then President Ratu Josefa Iloilo abrogated the country’s charter, formed an interim government that is to remain in power until 2014, and then reappointed as prime minister Commodore Voreqe Bainimarama, who has ruled Fiji since staging a coup in 2006. Freedom of expression and of the press have also been under heavy strain under the Public Emergency Regulations (PER) that, said the Suva-based Citizens’ Constitutional Forum, would only be replaced in name by the proposed Media Industry Development Decree 2010. According to the forum’s executive director, Rev Akuila Yabaki, the draft decree only "allows strict media censorship to continue in Fiji". "PER and censorship must be lifted so that citizens of Fiji can enjoy the right to receive and impart information and diverse opinions," Yabaki said. journalism to officers and authorities appointed by the Bainimarama regime. "This decree is clearly focused on the regime retaining control and entrenching its highly oppressive restrictions, not only on the media but (also) on members of the public who might wish to express dissenting views," the IFJ said in a statement. At the same time, IFJ general secretary Aidan White said it "strictly limits the ability of Fiji’s media to regain its role as a critical watchdog on the accountability of power-holders, and must be substantially rewritten or withdrawn". 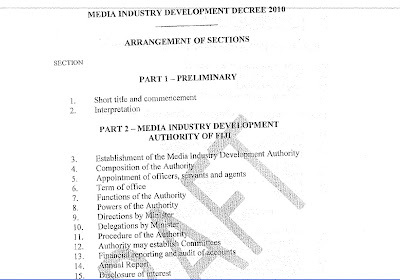 Among other things, the draft decree calls for the formation of a Media Development Authority whose powers would include compelling media outfits to disclose the documentation they performed for their stories. The body would also be exempt from legal proceedings unless it can be shown that it acted in bad faith or without care. Offences outlined in the decree meanwhile include publishing or broadcasting material that is against public interest or order, offends good taste or decency, or creates communal discord. The draft decree’s miscellaneous provisions also hand the minister concerned wide-ranging powers to stop broadcast or publication in an emergency. Precisely what constitutes an "emergency," however, is not defined. The same minister gets to appoint, as well as dismiss, the director of the Media Development Authority. According to Prime Minister Bainimarama, the proposed decree will set a better relationship with the media. But the draft law was already clouded in controversy even before it was tabled on April 7, withmedia organisations and interested parties complaining that they were not given enough time to scrutinise the 49-page document. Those who registered for the consultations were asked to collect copies of the draft at 8 a.m. or 90 minutes before the consultations began at the Holiday Inn Hotel in Suva. They were also not allowed to make copies of the document, which they all had to return afterward. The international media monitor Reporters Without Borders, however, apparently read enough to issue a statement on April 8 that said the draft decree is an "authoritarian imposition by a regime with no democratic legitimacy". "Nowhere is press freedom mentioned in this proposed decree, which appears to be designed to enable the military government to tighten its grip on the media – control of media ownership, control of content, and control of the dissemination of news within the country," the organisation said. The draft decree is reportedly modeled after Singapore’s media laws – which has not exactly provided any comfort to the local and international media. In the 2009 Reporters Without Borders press freedom index, Singapore was ranked 133rd out of 175 countries. Then again, it still bested Fiji, which fell 73 places from its position the previous year and landed on the 152nd spot in the index. It remains to be seen whether the draft decree would improve or worsen that ranking. What looks certain, however, is the draft becoming law. Although Attorney-General Khaiyum has not given any timeframe or date for its promulgation, he has said that it would be implemented in due course. Shailendra Singh is head of journalism at the University of the South Pacific. This article was originally published with the Inter Press Service. Cartoon: Malcolm Evans, Pacific Journalism Review. 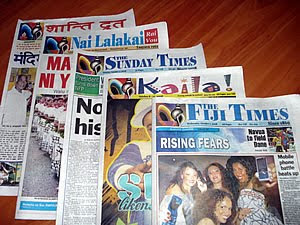 Fiji Times 'buy out' - who are the jackals? THE jackals are circling around the great Fiji Times carve-up, but no serious contenders have so far emerged. The Australian news group, wholly owned by News Limited, a subsidiary of Rupert Murdoch's US-based News Corp, is still hoping for a reprieve. 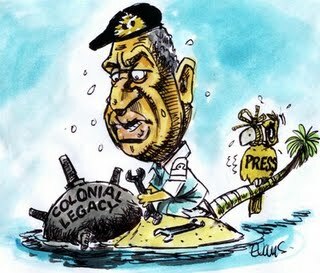 Although the military-backed regime is insistent that the newspaper must be ready to divest 90 percent of its shareholding to local Fiji interests when the draft media decree becomes law, Attorney-General Aiyaz Sayed-Khaiyum says there is no need for the country's largest and most influential newspaper to "close down". (b) up to 10 percent of the beneficial ownership of any share or shares in a company or any interest in the nature of ownership, partial or total, of any other person holding any interest in a media organisation may be owned by foreign persons, but at least 90 percent of the beneficial ownership of any shares or shares in a company or any interest in the nature of ownership, partial or total, of any person holding any interest in a media organisation must be owned by citizens of Fiji permanently residing in Fiji, whether any such interests subsist at the present time or are sought with a view to future ownership. A prominent businessman has denied rumours that his company is interested in leading a buyout of Fiji Times shares. Mahendra Patel, of Motibhai & Co Limited, laughed off rumours that the company was interested in the newspaper. Speaking from his Nadi office yesterday, Mr Patel said the rumours were news to them. “We did not even know that Fiji Times was on sale,” he said when queried about the rumours. Australian newspaper company News Limited owns the Fiji Times. However, under the draft of the Media Industry Development Decree, 90 per cent of such ownership must be held by local interests. Meanwhile, the Fiji Sun, which editorially takes an opposing view to the Fiji Times and is seen as being more pragmatic and accommodating to the regime, has condemned the Samoan prime minister, Tuilaepa Sailele Malielegaoi, over an "erratic" attack on regime leader Voreqe Bainimarama. Tuilaepa talks about democracy. Yet he ruthlessly presides over the closest thing in the Pacific Islands to a one-party state. It takes a brave person in Samoa to take on Tuilaepa’s party machine. Tuilaepa talks about media freedom. Yet he shamelessly presides over some of the most draconian media laws in the Pacific Islands. They constantly threaten freedom of expression in Samoa. In fact, Tuilaepa still has much to learn, especially about leadership in the region. There has been a great deal of angst over Com­modore Bainimarama’s draft Media Indus­try Devel­op­ment Decree 2010 which fea­tures harsh penal­ties for jour­nal­ists and news organ­i­sa­tions which breach vaguely worded con­tent reg­u­la­tions. Being a free­dom of speech kind a guy, I can see too why this isn’t a good thing. How­ever, Fiji isn’t New Zealand and each coun­try has its own solu­tions to par­tic­u­lar issues of the time. Of those, only Aus­tralia has true free­dom of the press. The Asean Nations (Indone­sia, Malaysia, the Philip­pines, Sin­ga­pore and Thai­land, Brunei, Burma, Cam­bo­dia, Laos, and Viet­nam) with the sole excep­tion of the Philip­pines, and even that is mar­ginal, re true demo­c­ra­tic coun­tries, the rest, includ­ing Sin­ga­pore, Malaysia and Thai­land are author­i­tar­ian. If you don’t think Thai­land is, then try and write some­thing in the press against the King of Thai­land and see where that gets you. There are no free­doms that we take for granted in Hong Kong and China yet we have deemed it desir­able to have a FTA and also to not com­ment on their inter­nal politics. So why is Fiji dif­fer­ent. is it because gov­ern­ment was formed at the point of a gun? Yes? Then what about China? Their gov­ern­ment was formed at the point of a gun when the Com­mu­nists over­threw the legit­i­mate Kuom­intang gov­ern­ment in 1949. At the moment we are also busily nego­ti­at­ing anti free­dom treaties like the Anti-Counterfeiting Trade Agree­ment (ACTA), a law and treaty at the behest of big busi­ness, but I don’t notice Keith Locke or Labour rail­ing against that. We are also nego­ti­at­ing an FTA with coun­tries from the Gulf States, (Bahrain, Saudi Ara­bia, the sul­tanate of Oman, Kuwait, Qatar, and the United Arab Emi­rates.). Autoc­ra­cies the lot of them with­out exception. And so I come to Fiji again. For some rea­son New Zealand has a fix­a­tion, mostly for the neg­a­tive for Fiji. As I have demon­strated we want and have FTA’s with coun­tries with far worse polit­i­cal sit­u­a­tions, far worse human right records, and yet we impose sanc­tions upon Fiji and travel bans. The lat­est out­cry has been over press free­doms yet in our own coun­try of New Zealand we have gov­ern­ment organ­i­sa­tions cur­tail­ing free­doms with a self imposed censorship. These are media organ­i­sa­tions that con­tinue to spread rumour, innu­endo and straight out lies about the sit­u­a­tion in Fiji and Radio New Zealand, in par­tic­u­lar, has taken a line of shut­ting down any dis­sent­ing voice from the polit­i­cal group think about how “we” are sup­posed to think about Fiji. The other half of Whale Oil's column picks up on Café Pacific's recent posting about Radio NZ's Nights programme host Bryan Crump "dumping" one of the better informed Fiji analysts, Crosbie Walsh, formerly director of development studies at the University of the South Pacific. A case of silencing one of the dissenting voices that don't fit the politically correct view of Fiji? New Zealand television viewers were this week served up the first instalment of the $200-million dollar drama series, The Pacific. But what about the real life dramas that are being played out in the Oceanic region and the millions of New Zealand dollars and other nations' foreign aid money that is spent to prop up various Pacific nations? The reporting is patchy at best, given the shrinking budgets of mainstream media and the difficulties inherent in reporting from this sensitive region. News organisations are finding it hard to report Pacific issues and hold regional governments to account in the face of increasing media censorship and repression. Some of the problems can be put down to a clash of cultures. But journalists and editors face a daunting task when reporting on the actions of a military dictatorship, a semi-feudal monarchy and a group of emerging nations where tribal and clan loyalties are often at odds with basic democratic rights. The Royal Commission into the sinking of the Tongan ferry, Princess Ashika, has opened up an unsavoury can of worms and the latest "media rules" about to be imposed by the Fijian regime will further stifle debate in that country. Media7 this week surveys the media landscape in the Pacific with David Robie, Barbara Dreaver and Tim Pankhurst joining Russell Brown in the studio. 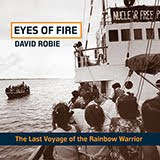 Dr Robie is director of the Pacific Media Centre and convenor of Pacific Media Watch. Dreaver is a seasoned Pacific affairs reporter who has experienced the heavy hand of a Pacific Island politician on many occasions. Pankhurst, former Dominion Post editor and now chief executive of the Newspaper Publishers' Association, is a fierce advocate of media freedom in the face of threats and intimidation, such as we are seeing in Fiji. Media7 is recorded in front of a live audience in the TVNZ Auckland Television Centre on Wednesday evenings at 6pm. Also, hear David Robie commenting on the Fiji media and the proposed draft decree on Radio NZ's Mediawatch, hosted by Colin Peacock and Jeremy Rose. WHAT ON earth has happened to Radio New Zealand? Or rather, Nights host Bryan Crump? He has apparently dumped professor adjunct Crosbie Walsh, the most informed New Zealand-based blogger and commentator on Fiji affairs (naturally you would expect this calibre as former and founding director of the development studies programme at the University of the South Pacific). Walsh is such a tonic after the plethora of one-eyed and sensationalist anti-Fiji blogs that clutter cyberspace. According to Walsh, Crump rang him last night, saying he didn't want the blogger/commentator on any more on Nights programmes. Why? Apparently because Walsh "feels too strongly" on Fiji issues (why not? 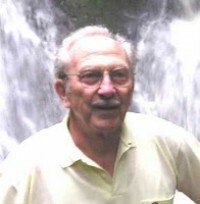 ... he lived there for more than eight years) and he "borders on the emotional" for this programme. Crump added: "It's not what a lot of my colleagues want to hear." Take this as you wish. Three more planned programmes on nights for Walsh for June, September and November have been canned. Crump (pictured right - Radio NZ image) reckons the Nights spot works best wi th "commentators" and Crosbie is seen as an "advocate". In fact, Walsh goes to great lengths to get some sort of balance in his blog commentaries, something sorely missing with many media commentators on Fiji. To be fair to Crump, he did invite Walsh to a symposium on Fiji later this year and, according to Walsh, was keen to interview him early next year. From all reports, Walsh had an enthusiastic response to previous Nights programmes. This has got Café Pacific wondering, especially when it is considered how unbalanced both Radio New Zealand and Radio Australia frequently are on Fiji commentaries. Opponents of the regime regularly have a field day, but many commentators who try to provide a bit more depth into explaining the Fiji "revolution", as Auckland University's Centre for Pacific Studies political sociologist Dr Steven Ratuva described it last week, or are not sufficiently PC or are too "soft" on the regime, are sidelined. A good example of this was a "stacked" Radio Australia feature by Bruce Hill marking the anniversary of the abrogation of the Fiji constitution one year on - four interviewees with a vested interest against the regime: Deported Fiji Sun publisher Russell Hunter - an Australian now living in Apia and is currently development editor of the Samoa Observer; an Australian judge, Ian Lloyd, who ruled against the regime; Australian National University professor Brij Lal - one of the three architects of the abrogated 1997 constitution; and Fiji Law Society president Dorsami Naidu versus Attorney-General Aiyaz Sayed Khaiyum. Where was the independent commentator to balance this line-up? New Zealand television viewers were this week served up the first installment of the $200-million dollar drama series, The Pacific. But what about the real life dramas that are being played out in the Oceanic region and the millions of New Zealand dollars and other nations' foreign aid money that is spent to prop up various Pacific nations? The reporting is patchy at best, given the shrinking budgets of mainstream media and the difficulties inherent in reporting from this sensitive region. News organisations are finding it hard to report Pacific issues and hold regional governments to account in the face of increasing media censorship and repression. Media 7 this week surveys the "media landscape" in the Pacific, featuring AUT's Dr David Robie, TVNZ Pacific affairs reporter Barbara Dreaver and former Dominion Post editor Tim Pankhurst, now chief executive of the Newspaper Publishers Association and a "fierce advocate" of media freedom in Fiji and the Pacific. 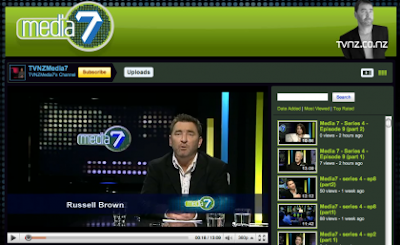 Watch for the Media 7 programme here. LINK to Pacific Scoop to hear Café Pacific's David Robie, director of the Pacific Media Centre, talking about the controversial Media Industry Development Decree being ushered in by the military-backed regime. 95bFM’s Will Pollard interviews Dr Robie on the implications for the future in Fiji - and also around the Pacific region. Two senior journalists at Fiji TV have been moved to lesser roles under claims they were biased against the Frank Bainimarama government. It is believed Merana Kitione and Anish Chand were sidelined because of their links to the National Federation Party. Kitione, Fiji TV's manager news current affairs and sport, is married to former Fiji Times journalist and administrative officer for the National Federation Party, Kamal Iyer. She is now acting training and development manager. Another senior journalist, and close colleague, has been moved with her - desk editor and team leader news, Anish Chand, who is now in production. Chand has friends in the National Federation Party. Kitione's old job has been filled by Tukaha Mua, who used to manage the programmes and distribution section, while Chand's position has been filled by Emily Moli. The Australian's Asia-Pacific editor Rowan Callick has filed a comprehensive article about the decree and the implications for the The Fiji Times, a subsidiary of the News Ltd media stable. 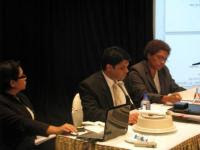 The [Fiji regime's] Roadmap aims to develop the institutional and economic infrastructure to benefit Fijians irrespective of race; it has taken a number of measures to reduce poverty and promote rural development; expose and punish rampant corruption and abuse of office; produce more harmonious relations between the major races; and in the 2014 elections all votes will be of equal value. In pursuit of these objectives, those who used their office or status to gain preferential advantage for sections of the ethnic Fijian elite (not all ethnic Fijians as they claimed), such as the SDL [Soqosoqo Duavata ni Lewenivanua] party, the Great Council of Chiefs and the upper echelons of the Methodist Church, and their counterparts in the civil service have been effectively sidelined. How was all this reported by the Fourth Estate? 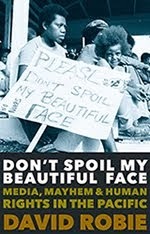 Between 2006 and the the Abrogation of the Constitution and the imposition of the Public Emergency Regulations (PERS) in 2009, the media - but most especially the Fiji Times - was totally hostile. On any reported issue, my count was that about four anti-government people to one government spokesman would be cited. On no controversial issue was the government position fairly reported. The Fiji Times position was that this was an illegal government, and by definition, nothing it did could be "good." Following the imposition of PERS, the Fiji Times published almost nothing (positive or negative) about what the government was doing. The de facto government had ceased to exist. But when, on the rare occasion, mention had to be made, the PM and other government people were referred to without their proper titles. This, however justifiable, was a deliberate insult that unwisely invited government retaliation. A third assumption is that western notions of media freedom usually provides the public with access to all information, presented in a fair and balanced manner. This is only partly true. Most media organisations are run as businesses, owned by businessmen and big business shareholders, and directed by people appointed by these same businessmen and shareholders. Rarely do we see the media speaking up for the poor, the underprivileged, consumers, the trade unions, workers on strike, or left-leaning governments. The Fiji Times most certainly did not when Fiji Labour Party-led government was in power. Media ownership and the extent of media freedom are linked. 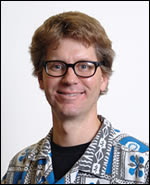 Professor adjunct Dr Crosbie Walsh, formerly of the University of the South Pacific, will be interviewed on Radio New Zealand National's Bryan Crump programme tonight about 9.40pm. THE SILENCE is deafening from the Suva-based Pacific Islands News Association - once the undisputed champion of media freedom in the region. Not a beep over the implications of the draconian Media Industry Development Decree in Fiji. 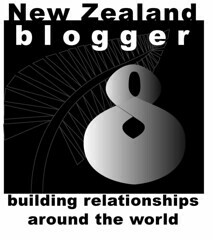 Behind the scenes, there are many disgruntled Pacific journalists who are bitterly disappointed at the donor-funded body's failure to show leadership. For many, the refusal of the PINA to relocate from Suva to another Pacific capital has seriously compromised the regional organisation. While Global Voices Online has compiled another good overview of cyberspace responses and the Pacific Media Centre condemned the 'draconian and punitive' draft decree, media report that PINA is still adopting a wait-and-see approach. 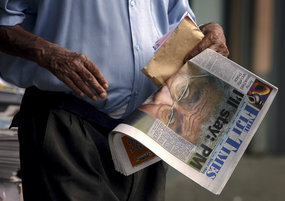 The decree will impose tight restrictions on foreign media ownership which will hit the Rupert Murdoch News Ltd-owned Fiji Times hard - and perhaps even lead to the demise of the country's oldest and most influential newspaper. But it will also impact on the Fiji Sun (expatriate directors) and the Daily Post (majority Australian shareholding). Ten percent foreign ownership of "beneficial" shares is the limit. PINA would like to try to meet with its members, like Fiji TV, Fiji Times, Fiji Sun before we could come to a conclusion on how we see this media decree. You could just gather from the meeting that they have their own point of view, so it would be good to sit down one-on-one with the various organisations. Last week, PINA vice-president, John Woods, broke ranks and called for the organisation to relocate. He also strongly criticised PINA for "kowtowing to the Fiji censors", saying this was contrary to what the organisation stood for - freedom of expression. The draft Fiji Media Decree adds further fuel, I believe, to the PINA debate. While PINA is a professional organisation, the Pacnews service is a news (media) service which admittedly, is regional in focus and regional in ownership (through PINA). It is, nevertheless, a media service. How will Pacnews be viewed by the interim regime - as a "foreign-owned" entity? Given the decree's requirement that Fiji-based media organisations/entities be 90 percent Fiji-owned and that all directors be resident Fiji nationals there are indeed questions PINA will, sadly, now have to address with regards to Pacnews' future. If, the interim regime makes an exception for PINA/Pacnews - again, sadly, this will only further fuel the accusations that PINA is "accommodating" towards the interim government. Some interesting times ahead with some difficult decisions to be made!!! It's also interesting to see Attorney-General Aiyaz Sayed-Khaiyum arguing the Fourth Estate debate in favour of media organistaions when his own interim regime and most other governments tend to dismiss the media's "fourth estate" role. It is also a great pity that most of his arguments about the Fiji Times ownership is to do with the fact that the newspaper has not given the interim regime the recognition/legitimacy it feels it deserves. Media organisations are business entities - just like other commercial organisations. If you are going to argue loyalty to a country (more so to an unelected government in this case) where do you draw the line? What about other foreign owned companies in Fiji? Already, we have the Reserve Bank of Fiji leaning on Fiji-based but mostly foreign-owned banks to be "culturally conscious" of the needs of Fiji's people. What next, - demand that Fiji-based but foreign-owned companies declare their loyalty to the government of the day? Interesting that mention is made of plagiarism but there is no acknowledgement in the draft that the Code of Ethics is an almost complete "lift-out" from the Fiji Media Council!! In all this, there are some good aspects to the decree but by and large, it simply continues (although in camouflaged form) the censorship the interim regime has put in place. SO Jim Anthony has had the last laugh. 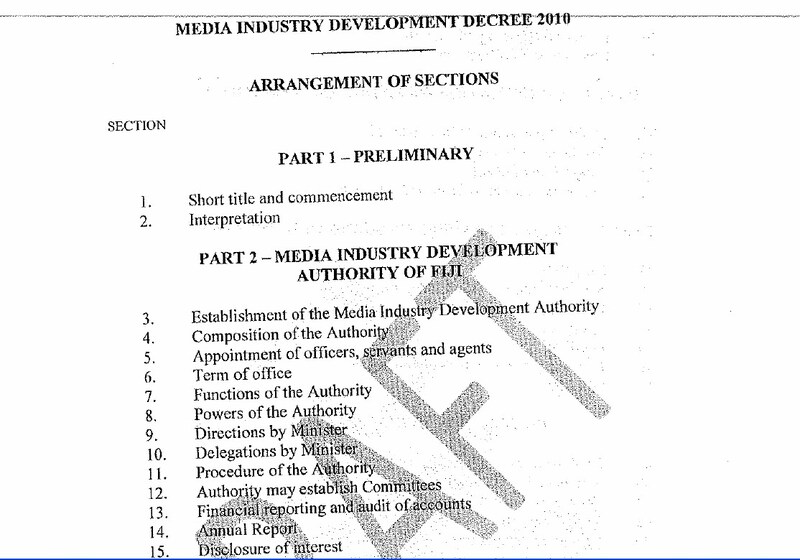 And at least two critical components from his discredited 2007 "Freedom and independence of the media in Fiji" report have found their way into the draft Media Industry Development Decree 2010. No surprise, of course. All the signs have been there for the past couple of years. It was a sure bet that the regime would adopt a Singapore-inspired Media Development Authority and a Media Tribunal with draconian powers (see p. 6 of Anthony's executive summary). But at least his crazy idea of a 7 percent development tax was ditched. The tragedy of the Anthony report and the public slanging match with the media that ensued is that neither should have never taken place. Had the Fiji news media got their act together and improved things on their own accord, rather that persevering with the "toothless tiger" Fiji Media Council with all its overdue faults, this draconian draft might have been headed off. The independent Media Council review in February 2009 was a job well done - but it was more than three years too late to have any impact. Now we have a ruthlessly chilling climate of self-censorship being imposed in post-coup Fiji. A year of censorship since the 1997 constitution was abrogated on April 10 is taking its toll. Soon we will have a generation of journalists (average age in Fiji is less than 25)that will barely know what it was like to work in a genuinely free press. The regime is systematically destroying what had been traditionally one of the strongest media industries in the Pacific. Media improvements were needed, true. Especially over "fairness and balance". But government authorities have ignored the commonsense independent Media Council review recommendations last year and instead been influenced too heavily by the harsh proposals of the discredited 2007 Anthony report. Among the major sticking points during today's discussions was the make up and independence of the Media Development Authority, the imposition of fines for breaching certain provisions under the decree, and the ability of the media to appeal or seek redress from the courts if the Media Tribunal ruled and imposed fines against them. Limits on foreign ownership of media organisations in Fiji also featured, with the proposed decree set to take out Australia’s News Ltd’s ownership of the Fiji Times. Actually, the foreign ownership limitation would gain widespread sympathy. Many believe that Rupert Murdoch's News Ltd and the Fiji Times have not been "in tune" with Fiji for many years. Nevertheless, a 10 percent limit is to punitive. Perhaps 49 percent and a reasonable adjustment window to divest shares would have been more realistic - and fairer. S4(1): The Authority shall consist of a director appointed by the Minister. Response: This is putting too much power in the hands of the minister. It could open the door to political appointments, and jeopardise the independence of the authority. The person appointed as director should be one who enjoys the confidence of all the stakeholders, not just that of the minister or the government of the day. There needs be more consultation; it's too risky to leave such a crucial appointment in the hands of one person or one party. 4(3): Director must be remunerated in a manner and at rates subject to terms and conditions determined by the Minister. authority, and it will protect the integrity of the minister also. 5(1) & (2): The authority appoints its own officers and servants and will determine its own salaries and conditions with the Minister as the approving authority. Appointments and salaries and conditions should be determined independently and in accordance with clearly stipulated procedures to avoid compromising the process, and to instill confidence in the authority. 6(2): The Minister may remove the Director of the Authority at any time from office if the Minister considers it appropriate in the public interest. The sole authority to remove the Director (coupled with the sole authority to appoint and remunerate) gives the Minister almost sweeping powers over this body which is cause for unease. 23. The fines and jail terms stipulated (F$100,000 to $500,000; or imprisonment for five years or both) for breaches of content regulation are too draconian. It will have a chilling effect and stop the media from reporting issues of national interest. It is a disincentive for new entrepreneurs wanting to enter the sector. It will also scare away people who may want to join the profession. This is the authority duplicating what the courts are already empowered to carry out. This is outdated, and contrary to whistleblower protection legislation being mooted nowadays as a safeguard against corruption. This is not something that will encourage investigative reporting, which is something this government claims it is keen to promote. This is the authority duplicating police work. Any person who fails to disclose documents faces maximum fines of $100,000 and jail terms of up to five years, which are quite harsh. This will put an end not only to the whistleblowing culture, but media disclosure of confidential documents in the public interest. The tribunal can order the media organisation or any employee to pay monetary compensation to aggrieved complainants. We already have defamation and other laws for compensatory damages. Why duplicate this function and waste resources? This is something best left to the courts. Summing up: The decree gives too many sweeping powers to the minister which can be dangerous. There is duplication of the work that courts have been set up to do, which is an unnecessary waste of resources. The fines and jail terms stipulated are extremely harsh. The media has been denied the freedom it needs to inform the public and to act in its interest. THE whistleblowing website WikiLeaks' tape apparently showing the cold-blooded murder of civilians - including two Reuters journalists - by US troops in Iraq in 2007 has shocked the world. It will undoubtedly form the basis for an ongoing investigation by the global news agency - one it had sought in vain nearly three years ago. 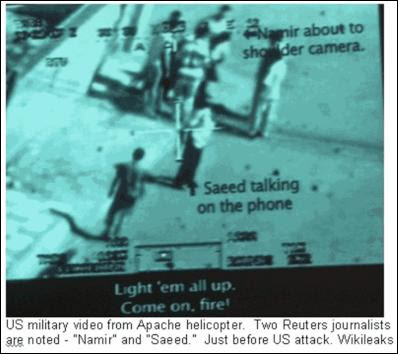 The video, shot from an Apache helicopter gunship, clearly shows the unprovoked slaying of a wounded Reuters photojournalist, Namir Noor-Eldeen, his assistant, Saeed Chamagh, and his rescuers. Two young children involved in the rescue were also seriously wounded. 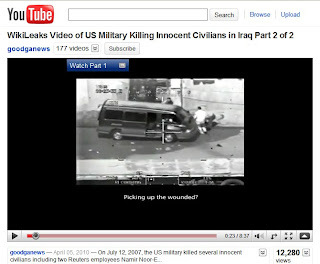 The video captures an incident on 12 July 2007 in a Baghdad suburb. This event has been a matter of controversy since the killing of the two journalists. This chilling footage will renew pressure for a full investigation, and asks a Pacific journalist: "Is WikiLeaks the future of investigative journalism?" WikiLeaks has produced more scoops than the Washington Post has in the past thirty years, according to a report by The Guardian. The web-based service was “founded by Chinese dissidents, journalists, mathematicians and start-up company technologists, from the US, Taiwan, Europe, Australia and South Africa”, according to their “About” page. WikiLeaks targets oppressive regimes throughout the world, as well as regimes seeking to repress information on illegal and unethical government actions and policies. The website's organisers say they were leaked the footage, which they say come s from cameras on US Apache helicopters. Accoirding to the BBC, they say they decrypted it, but would not reveal their source. The WikiLeaks site campaigns for freedom of information and posts leaked documents online. So far there has been no official Pentagon response. However, Reuters and the Associated Press have been widely quoted unnamed US military officials as confirming the video was genuine. The Baghdad video is the latest in a long list of "leaks" published by the secretive site, which has established a reputation for publishing sensitive material from governments and other high-profile organisations. In October 2009, for example, it posted a list of names and addresses of people it claimed belonged to the British National Party (BNP). The BNP described the list as a "malicious forgery". REPERCUSSIONS from Tonga's "rust bucket" disaster that killed 74 people - mainly women and children - at sea in the kingdom last August are finally rocking the royal and noble establishment to its very core. And while several layers of maritime and government authorities have been exposed, some senior expatriates look set for paying a heavy price for the tragedy. Comical efforts by Information Minister 'Eseta Fusitu'a to effectively gag the local Tongan media over the Royal Commission of Inquiry into the Princess Ashika ferry disaster last August 5 were in vain as Matangi Tonga reported on the here-is-the-report-but-you-can't-have-it farce. Barbara Dreaver, writing on her TVNZ blog, also took a potshot at the Tongan government for "hiding behind procedures". As well as extensive coverage, the online news portal Matangi Tonga published a leaked copy of the inquiry report. It was also published by Pacific Media Watch. The leaked report has been highlighted by the Scotsman for describing Lord Ramsay Dalgety QC, secretary of the Shipping Corporation of Polynesia, which operated the government-owned ferry, as "unfit to hold such an important position", "lacking credibility" and accused of being "evasive when giving evidence". The commission also said the former director of Scottish Opera was "dishonest and lacked integrity in his role". Lord Dalgety, 64, was arrested, charged with perjury, and put under house arrest for 24 hours on his last day of giving evidence to the committee in February. Tonga imposed a blackout on reporting the case. Two others had been arrested earlier. Radio NZ International reports that the New Zealand businessman who formerly headed the Shipping Corp, John Jonesse, is one of three people charged with manslaughter by negligence over the sinking of the Ashika. Court officials named the other accused as the former skipper of the Prin cess Ashika, Makahokovalu Tuputupu, and the acting director of Tonga’s marine division, Viliami Tuipulotu. The Shipping Corp itself is also facing a charge of manslaughter. It also says the sinking was the result of systemic and individual failures and that the deaths were both "preventable and senseless". [Lord Dalgety] has been strongly criticised in the report for failing to order an independent survey before the purchase of the ferry, which he admitted to the commission in January had been a "rust bucket". The report criticised Lord Dalgety's lack of competence in admiralty law, in which he said he was a specialist. It described as "disturbing" the fact that he did not have an up-to-date copy of the Shipping Act and admitted he had not "checked it for years". A claim by officials that the vessel was in good condition or well maintained "is not only patently absurd, but dishonest", the report said. It notes the ferry was "grossly overloaded" the day it sank. Lord Dalgety, a former Conservative councillor on Edinburgh District Council, moved to Tonga in 1991. In 2008, King George Tupou V made him a law lord and privy counsellor with the title Lord Dalgety of Sikotilani Tonga – Lord Dalgety of Scotland. Lord Dalgety holds a number of powerful and well-paid posts in Tonga, including chairman of the electricity commission. The royal commission said it considered evidence regarding civil responsibility, but that determining criminal responsibility was up to other authorities. Police have said their investigations are continuing. Meanwhile, the Tongan king is under pressure to sack members of government amid allegations they were in part to blame for the failures that led to the tragedy. Pacific Media Watch's Josephine Latu has filed some excellent reports on the leaked inquiry, including a comprehensive backgrounder, on Pacific Scoop. The full inquiry report is on the Pacific Media Watch database. 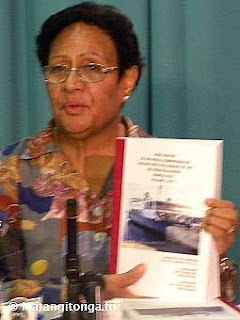 Pictured: Top: Tongan Information Minister 'Eseta Fusitu'a tells local media they can't have the Ashika inquiry report she is holding. Photo: Matangi Tonga. 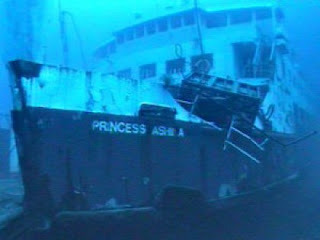 Above: The Princess Ashika at the bottom of the Pacific Ocean. Photo: Royal NZ Navy.